Alkus sheets in Novatec’s wall & slab formwork systems. The perfect recycling cycle – Real profit for the environment & the contractor. Building contractors, formwork contractors and keen cost estimators will be delighted: A Forming face without swelling and shrinkage. As disposal of man made products (such as traditional plywood) gains more and more importance, customers often ask when purchasing as to the potential cost of disposal. In the case of Alkus sheets, effective recycling has been a driving force in the development. Because of this, a return guarantee now offers for the first time – a money-saving, environmentally friendly solution. How often are you faced with forming faces that are penetrated by moisture after only a few applications, leading to changes in dimensions, eventual de-lamination and the load-bearing capacity can sometimes drop by more than 50%. With the Alkus sheet there is no swelling or shrinkage – once and for all. As no water can penetrate the panel, there are no changes due to moisture or to the geometry, nor to the mechanical values. Further more, there is also no loss due to rotting. Up until now, the swelling performance of the plywood required the frame profile to project which resulted in the disadvantage that the profile nose left an impression in the concrete. With the Alkus sheet, this flaw has been overcome. Diameter growth due to moisture is a thing of the past. And: the additional overall height of the panel can be statically used. This results in improved and more even concrete surfaces during the entire life of the panels. The consumption of timber resources, in particular in the area of tropical timbers, has played a major role over the years in the destruction of natural forests in order to produce timber products such as plywood. Furthermore, plywood panels bonded with phenolic resin were, as a rule, disposed of by means of burning, with poisonous dioxin developing in the process. The Alkus sheet does away with all of that. During the development stage of Alkus, an objective of a one hundred percent recyclability was among the indispensable requirements. 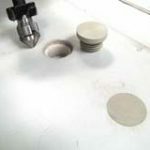 The plastic surface does not enter into a chemical reaction with concrete. This is why the use of a little amount of release agent is necessary (only in the area of the frames). 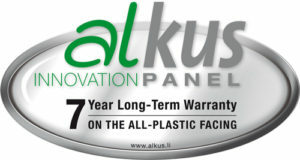 With the Alkus-recycling concept, old and used panels are recycled into similar products. On top of that, the cleaning effort has been clearly reduced, saving in pollution and the use of our natural resources. The nailing properties of Alkus are equal to that of plywood with one major advantage, no chipping off of the face veneer. The unavoidable disadvantage of plywood is that the face veneer chips off. Moisture then enters and reduces the quality of the panel, reducing the life expectancy. With the Alkus sheet being as nailable as plywood, it is clear to see why it is the preferred choice. The nail pull-out strength has been confirmed by comparative tests with plywood. See images below ‘Smooth Nailing’. In the case of mechanical damages, a costly repair with a 2-component epoxy resin compound is necessary to repair plywood, generally at the cleaning or regeneration plant. The Alkus sheet is repaired with the same material as the facing. This increases the quality of the repair and leads to an increased service life of the panels. …All resulting in a life span of the Alkus sheet which is as long as that of the frame itself. Over the years, formwork technology has been developing to its present level. Large and small improvements have made the use of wall and slab formwork systems more and more economical. However, one thing had always remained the same: the use of plywood as a forming face. The known disadvantages were accepted, as alternatives were in short supply. However, at the turn of the century, a decisive leap in technology was achieved with the development of the alkus plastic sheet. The first ideas for the development of a new forming face were born at Meva – Germany. Both for ecological as well as for economic reasons, plywood could not be considered a permanent solution for a forming face for steel and aluminium frame formwork. Destruction due to water absorption. Destruction of the environment due to disposal. The problem of disposal of the phenolic resin bonded plywood faces, which became more and more urgent, meant a new dimension to the request for a total recyclability of the product. Load-bearing capacity through flexural strength – highly important for the deflection and thus for the evenness of the concrete surface. Research to find a suitable material was pushed ahead in several directions. Possible solutions such as: honeycomb panel, wooden cores with plastic covering, and laminated panel were deliberately rejected. The realisation took shape that the solution could only be found with an all-plastic panel. This, however had to be a composite of synthetic and other materials which would increase the load-bearing capacity, as the modulus of elasticity (measure for rigidity) of synthetic materials alone would not be sufficient to achieve the required flexural strength. Numerous patents date from this phase of the development. With this, the theoretical requirements on the product had been defined. Now it was necessary to create a product that could be utilised in the industry through the interaction of science and practice. This task was assigned to a development group, as all previous stages of development had shown that such complex developments could only be solved by means of the effective cooperation of experts from research and practice. MEVA as partner providing the industrial practice. Make no mistake that, Alkus sheets also have to be cleaned after a certain number of applications. Surface scratches and penetrations cannot be avoided as everyday occurences on a building site is tough. But cleaning and repair of the Alkus sheets makes for ease of use, as there are good, fast and practical solutions for both. At the building site, it is possible to clean the panels without any problem by means of high-pressure water jet or with soft, rotating brushes. At a fixed price, you can have a thorough cleaning of panels and frames carried out at Novatec’s regeneration plant. 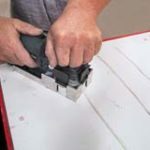 Minor mechanical damage, for example scratches, can be repaired with the use of polypropylene, hand held tools such as recessing and shaping machines at the building site or at the contractor’s yard. However, the much simpler solution is to entrust your formwork to us. We do not only repair the scratches, but also penetrations, large-surface damage and much more by means of a special method which also uses polypropylene. Here too, we offer clear, fixed prices. We are your service partner for everything to do with formwork. The damaged area of the thermoplastic synthetic material is preheated with the manual welding device, and then filled with a heated plastic strand. The filled damaged area is then rendered smooth with a commercial recessing and shaping tool. Penetrations and more extensively damaged areas are simply bored and plugged with plastic plates. The different phases of damage when nailing on recesses. In the case of Alkus sheets: smooth penetration of nails when fastening recesses. No further damage and no chipping off. Removing of separating boards for recesses only results in simple nail holes without any craters. Determination of push-in and pull-out force of nails.